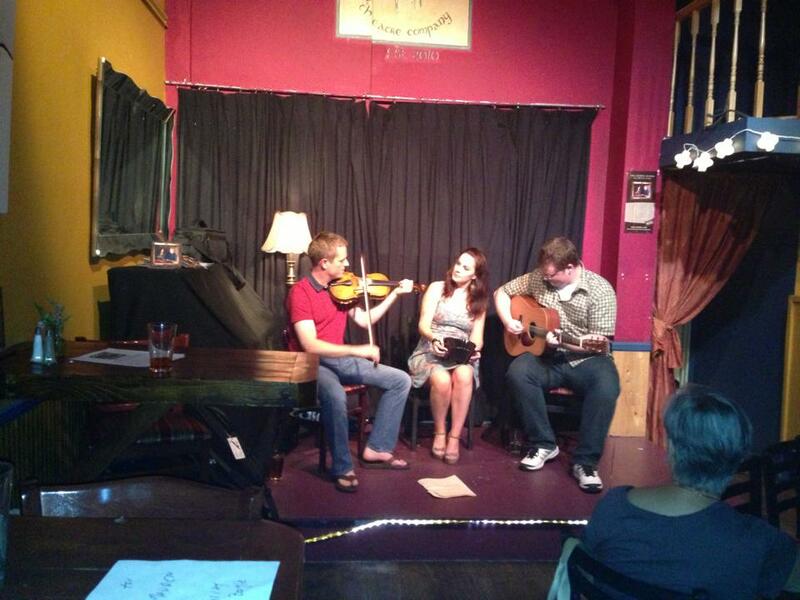 An Beal Bocht fireside trio of Neill Byrne, Edel Fox and Dylan Foley. Within the realm of Irish traditional music followers there is a special place for music that is played in the fireside manor so authentic you can imagine a whiff of peat in the air as you listen. Images conjured up are those of the ould fellas sitting close to the fire sharing chunes after a hard day’s labor in the fields around the farm with one another and neighbors who rambled along for the occasion. The music could be slow and lonesome, lamenting those who are gone below ground or emigrated, or spirited and joyous, as much of the dance music would be inspiring set dancers to go round the house and mind the dresser. It was the music of the Irish rural community for the most part enjoyed by a humble hearth that also been carried in the hearts as the Irish men and women left the homeplace for Dublin, England or overseas to America, Canada or Australia. Listening to the tunes would always transport them back to Erin’s Isle no matter where they landed. They were always meant to enjoyed in more intimate company, more of a niche folk art for those who truly appreciated it, and wasn’t intended for mass exploitation and marketing. I’m waxing philosophic because the greatest thing to happen to Irish traditional music over here is a return to the house concert format where the connections between performing artists and the audience is much more socially oriented and akin to the fireside settings of old. Back in the “roaring nineties” of the last century the ascendancy of Riverdance and the Celtic Tiger floated the boat of all things Irish and even allowed more and more Irish trad musicians to think of a making career out of playing, buoyed by more robust CD sales, concert tours and rising festivals. Worldwide attention and fascination saw commercial Irish Trad groups join the pioneering Chieftains on some of the finest and most respected performance stages to be found anywhere. While Riverdance is still alive and kicking and discovering new markets like China where a billion people still haven’t seen it, the commercial sales and outlets have diminished for Irish trad artists who must be more resourceful these days to promote their music. But undeniably the standard of trad music and the numbers of people playing has multiplied significantly in that progression from the fireplace to the marketplace, and there are still many people around the U.S. who share the enthusiasm for it, even if they seek different venues to hear it. Thankfully there is a coterie of sleeper cells around the country that are willing to invite performers on tour to come play in their houses or simpatico performance places that place the artists comfortably alongside their admirers. These thoughts were running through my mind as I watched a trio of elegant performers on Sunday at An Beal Bocht café in the Riverdale section of the Bronx. The featured artists were concertina player Edel Fox from Miltown Malbay, Co. Clare and fiddler Neill Byrne from Ferrybank in Waterford City, who were accompanied on guitar by our own shining New York star Dylan Foley, who also took up the fiddle on occasion which has won him All-Ireland acclaim in the past. Playing a mixture of old and new tunes in a manner that could hardly be described as your grandfather’s style of Irish music, they played with dynamic energy and finesse that gave a vivid display of how the music has evolved. Both Fox and Byrne would be steeped in the music from their early years influenced by some of the finest musicians in the tradition like Noel Hill, Jackie Daly or John Dwyer. They not only learned their music very diligently but are teaching it in a manner that will give it life for a good few generations to come. They come from that generation that knows a good thing when they hear it, and have the technique and the tools modern music affords to pass it on and make it look cool. As successful teachers they continue to learn as much about the music themselves as they impart to others. Their performance highlighted the music of their new brilliant CD The Sunny Banks containing 16 tracks of gorgeous playing of well-sourced and varied tunes from many well-known composers and musicians in the tradition. The informative liner notes (always an advantage to buying a CD in this age of downloading) give ample evidence to the attention and close collaboration they bring to their music, and they have partnered up these past three years bringing this soon to be classic CD to fruition. Their performance at An Beal Bocht brought two spontaneous standing ovations at their finale and encore with musicians like Brian Conway, Joanie Madden, Dan Gurney, Don Meade, Mirella Murray, Mary Coogan, Erin Loughran, Mickey Coleman and Deirdre Connolly among the aficionados present and enthralled by the lively sets in comfortable storefront back room. The pair set aside three weeks to do a tour of the Northeast U.S. to support the new recording and basically climbed aboard the underground railroad route of the house concert formats, including a pair of fiddle factories in New England, the Burren Back Room Series (where they were paired with the Murphy Beds featuring the sublime duo of Eamon O’Leary and Jefferson Hamer) which is more of a listening room scenario hosted by WGBH’s Brian O’Donovan, and at musician Kathleen Conneely’s Rhode Island house affectionately known as Kathleen’s Pub. Of course musicians turned out by the score to encourage their artistic brethren, but many faithful listeners as well as this becomes the way people want the music delivered to them in a live setting sans bar room noises and disruptions. Costs are also spared in alleviating the middle man venues where sharing a piece of the smaller pie these days didn’t really benefit some owners in the pub trade or with bigger houses to fill and maintain. While I moan about the “music business” from time to time, it doesn’t really interest me as much as the opportunity to see and hear dedicated and talented musicians like Fox and Byrne in any setting because there is a passion in their playing that compliments the mastery of their craft. And that is why the seeds of those early fireside sessions will continue to flourish when the younger generation has role models like this pair who clearly enjoy the music and all the craic that goes with it. Their cavalcade continues on with an appearance later this week in Monroe, Connecticut (www.shamrockirishmusic.org) and points south with more details at www.edelfoxmusic.com or on Facebook-The Sunny Banks Edel Fox and Neill Byrne. The CD can be ordered at CD-Baby or from Custy’s Music Shop in Ennis.